Posted on Tue, Jan 3, 2012 : 5:58 a.m.
Michigan football coach Brady Hoke: "I think this is where Michigan should be." NEW ORLEANS — After five weeks of talking about being back on the national stage, it's finally here. The No. 13 Michigan football team (10-2) will face No. 17 Virginia Tech (11-2) at 8:30 tonight in the Sugar Bowl (ESPN), its first BCS game in five years. It'll vie for its first BCS win in more than a decade. Curtain's up, Michigan. The nation is about to be re-introduced to you. Although, according to head coach Brady Hoke, the Wolverines were never gone. "I don't think Michigan ever left (the national stage)," he said Monday at his final news conference before facing the Hokies. "There was maybe a lean year or two, but Michigan was always Michigan — and will be." That echoed Hoke's proclamation when he first arrived in New Orleans. "I think this is where Michigan should be," he said from an airport hangar, barely 10 minutes after landing here. "It’s an expectation for Michigan to be in BCS games." 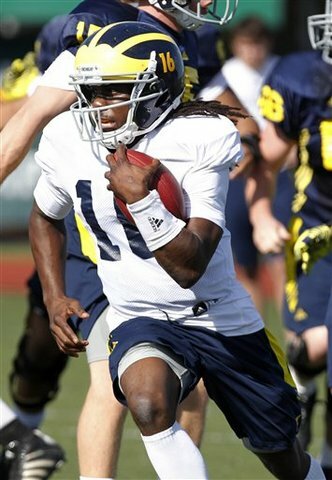 Michigan quarterback Denard Robinson runs during a practice at Tulane University earlier this week. The Wolverines will be looking to reverse their bowl fortunes, after going 2-6 in their past eight postseason appearances. They are 1-3 all-time in BCS games, with their lone win coming against Alabama in the 2000 Orange Bowl. Hoke was on that staff as an assistant. It's been a tough postseason run for college football's winningest program. In fact, the Wolverines have a losing record all-time in bowl games, going 19-21 in their 40 appearances. And, of course, they've had a tough run even in the regular season of late. Michigan was 15-22 during a tumultuous three-year run under former coach Rich Rodriguez, a tenure that was terminated just days after last season's 52-14 loss to Mississippi State in the Gator Bowl. Players are looking to rid themselves of that history — especially the seniors, whose legacies include no league titles and a combined 1-7 record against the school's two biggest rivals, Michigan State and Ohio State. "The biggest thing for us is if we drop this game, and we have a poor performance, especially defensively, (after) everything we’ve worked for, people will come back and say, ‘Well, they were good during the season, but look what happened in the bowl game," senior defensive lineman Ryan Van Bergen said. The Sugar Bowl matchup between Michigan and Virginia Tech create some interesting storylines. We’ve been covering them all for weeks. Check out our Mega Guide for a compilation of links to all Sugar Bowl-related stories on our site. "We don’t want there to be a negative stigma about our defense, when all is said and done. We want everything to be positive and not have anybody stand on a platform and criticize us." Michigan hasn't played since beating Ohio State 40-34 on Nov. 26, and feels as though it has something to prove. Managing nerves will become paramount, especially early in the game as the team shakes off rust from the five-week layover. Quarterback Denard Robinson will be of particular concern because he is so integral to the offense's effectiveness, but also has been known to have trouble managing his excitement early in games. He became much better throughout this year, though, relying on a secret weapon he revealed for the first time Sunday: R&B. "I listen to slower music now in the pregame," Robinson said. "It calms me down." Hoke isn't as much of a concern. He's said in the past he's most anxious on the days leading up to a game, when preparation is at its peak intensity. On game days, he's much more relaxed as he designates scheme and play calls to his coordinators and players. "Once it hits the game, it’s just, you might as well give him a cocktail and a lounge chair," senior center David Molk said recently. Despite the magnitude and build-up to this game, Hoke said Monday he expected to remain calm today, even if a few extra butterflies would be understandable. 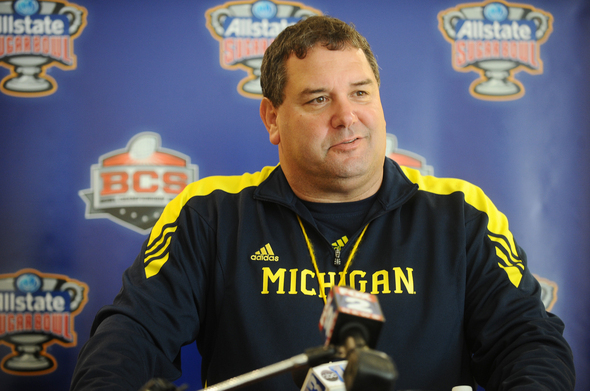 "It's going to be fun," Hoke said. "It's going to be a lot of people cheering and it's going to be bands there and people are going to have fun." Hoke said he'll use a similar routine today for keeping his players sharp as he did for previous night games against Notre Dame and Northwestern, when he got them up late, had them watch film and went through walk-throughs to remain active. The Wolverines won both those games. In fact, they were 4-0 this year in games that started at 3:30 p.m. EST or later. So, that routine — something Hoke developed while often playing at night out west at San Diego State — seems to be effective for this team. Something they haven't faced this year, though, is playing indoors, and now they will play in the Superdome, known as one of the loudest stadiums in the country. "In a game, you kind of get into the flow of loud when the defense is on the field, quiet when the offense is on the field," Van Bergen said. "This game, I don’t really know. I think it’s going to be more World Cup, without those big horns. It’s going to be loud all the time." Van Bergen said the defense will resort to hand signals in the game. Other games in which they used those signals include Notre Dame, Ohio State and Nebraska — each wins, although the defense played poorly against the Fighting Irish and Buckeyes. The lighting, which stretches all the way around the stadium, also could be of concern. Hoke said he's not worried about the environment, even though Virginia Tech's Frank Beamer has coached in the Superdome in three BCS games and four times overall. He's 1-3 there. The Hokes' head coach is in the midst of a 25-year run at the school, and has taken it to 19 consecutive bowl games. He's been with defensive coordinator Bud Foster for 24 years. Conversely, Michigan's staff is in its first year together, an experience differential that could prove to be a disadvantage, Wolverines offensive coordinator Al Borges said this week. Molk, though, says the staff is wise beyond its years because Hoke hired like-minded guys in Borges and defensive coordinator Greg Mattison, among others. "This coaching staff could easily be compared to one that has been here 30-plus years (because of) the congruency of a fixed goal and something they all stress together as a unit," Molk said. "A lot of times, when coaches coach together for a really long time, they all think alike. Well, these guys do." They all have one thing on their mind tonight. Tue, Jan 3, 2012 : 11:42 p.m.
spartyville just can't get enough of MICHIGAN. . . what's a matter sparty dident get a good enough bowl? i CROWN you king of sour grapes! GO BLUE!!!!!!!!!!!!!!!!!!!! Tue, Jan 3, 2012 : 6:29 p.m.
Geez Spartans! Move on and quit your whining! Tue, Jan 3, 2012 : 5:34 p.m. I'm rooting for a Michigan win tonight! Tue, Jan 3, 2012 : 3:23 p.m.
Blue has too play the complete game. Complete GAME. Tue, Jan 3, 2012 : 3:15 p.m. Sorry, staters...it is what it is. lol You, too, could do it. Just win all but 2 games. Oh, and GO BLUE!!!! Tue, Jan 3, 2012 : 9:05 p.m.
Hey justin, easy schedule? Lets take common opponents, NW, Minny, Neb, ohio, ND, iowa, .......drumroll please.................. SPARTY 125 OPPONENTS 124.......UM 236 opponents 130 Then theres the obvious like the other guy posted, you lost 3 games, and 2 of them were not close. You, DUMBtonio, Cousins and all the other crybabies can complain all you want, wont change a thing. All things being even, UM will ALWAYS get the nod over lil brother!! Go Blue!! Tue, Jan 3, 2012 : 6:51 p.m.
Tue, Jan 3, 2012 : 3:08 p.m. I don't think a bowl appearance, win or lose, is needed to validate this season. 10-2 is all the validation that is needed. Tue, Jan 3, 2012 : 3:05 p.m.
What the big deal about the Sugar Bowl? It's just another football game that dosen't mean a thing. Tue, Jan 3, 2012 : 7:09 p.m.
Not to mention it's Tuesday. Why doesn't this game get a better day slot. Tue, Jan 3, 2012 : 2:23 p.m. I for one am glad it's game day. Then maybe after three or four more days of this crazy ridiculous overblown coverage will be over for a while and we can get back to local news instead of local sports. Wed, Jan 4, 2012 : 5:11 a.m.
@ Booby....sigh....some people who live in Ann Arbor who graduated from an actual Big Ten university rather than a junior college like yourself, actually come to the site to read area sports information...there are actually 3-4 colleges in the Ann Arbor area (UM, EMU, Concordia, Baker, and WCC) and they all have athletic teams. I know better than to come here to read MSU news, other to gloat at how obsessed Walmart Nation is with us and our success. Tue, Jan 3, 2012 : 8:57 p.m. I think they were really reaching with the story about van bergen's hair. Oh, and also the one about the basketball coach being a UM football fan. Tue, Jan 3, 2012 : 8:38 p.m.
Why would any Sparty sports ever be covered by AA.com? They would only be mentioned when UM is their opponent. Hard to understand why ANY Sparty fan would look for MSU news on a UM/AA site. Does East Lansing do any reporting on Sparty? I go to UM sites for UM sports. Ill give you one source for your Spartans, the DETROIT FREE PRESS, they're clearly Sparty lovers, thats why I stopped reading it a long time ago. Sounds like you might have a &quot;lil brother complex.&quot; Go Blue!! Tue, Jan 3, 2012 : 7:08 p.m. I don't read it, dude...but it's so over the top some days I think I am opening the sports page. ehhh whatever. Go blue, hokies chokies and congrats green. Tue, Jan 3, 2012 : 6:36 p.m. I blame Obama. He and his commie buddies are clearly forcing you to read and comment on stuff you don't care about. Tue, Jan 3, 2012 : 5:40 p.m. I agree. A2dotcom's &quot;sports&quot; coverage...which is slightly better in the print edition than the online edition...is basically 90% UM, 5% local high schools, and 5% everything else. There also seems to be a rule that ALL coverage of ANY MSU sports must contain a negative spin. It's kinda perpexing, given that there are probaly many people in the Washtenaw County area who graduated from other state schools who might be inclined to pick up the paper were it not so one-sided. Ironically, the UM Daily has more comprehensive coverage of college athletics (i.e. all the big ten schools...) than A2dotcom does. By local, I assume you mean within the city of Ann Arbor. Wayne State played in a national championship football game this year and two other Michigan Football Division 1 teams were in bowl games; one of them actually won and the other was pretty close and was played just a few miles from Ann Arbor. Not a word about any of this in annarbor.com. Annarbor.com doesn't report too much on local sports, they report too much on city of Ann Arbor sports. Tue, Jan 3, 2012 : 2:19 p.m. It's only a game, boys. Lighten up. Tue, Jan 3, 2012 : 1:26 p.m. The only thing they will validate is how to back into a BCS Bowl and be successful.They are there as a poster child to a flawed system and that's all there is to say about that. Will they win?probably but a hollow victory it will be indeed. Read the post of mmppcc.he knows and he says it. can't wait to read the posts of the Arrogant Blue and Yellow fans after the Backed In Bowl is over.I'm sure they'll be classic. Sec fan, Bama didnt win their DIVISION, the only reason theyre even in it is A) Boise, Ok St., and Stanford all blew their chance, B) the first game was played on nov 5, had it been later in the year, Ok St. Would be in instead of Bama due to the timing of the loss. SPARTY had 3 losses, by your logic, Oregon should be in the title game and get a rematch, they lost 2 games but they won their conference. BAMA didnt win their division, or conference ANd didnt play in SEC championship. Tue, Jan 3, 2012 : 6:42 p.m.
Based on your logice SEC Fan, Alabama was not good enough to play in the SEC championship and should not be in the NC game. Correct? Clearly LSU was better. Tue, Jan 3, 2012 : 5:16 p.m. So, if UM should lose tonight (heaven forbid), that would give them 3 losses and MSU would have more wins (12). Ergo, MSU would be the better team, right? The so-called &quot;logic&quot; you big 10 people use is astounding. Plain and simple, UM wasn't Good Enough to play in your conference championship. Period. MSU was. UM got in to a BCS game strictly because of the $$ they can bring, not because of their on-the-field performance. MSU is definitely the better team, regardless of the outcome of tonight's game. And I believe they proved it, quite convincingly, back in October! Tue, Jan 3, 2012 : 3:57 p.m.
Evidently you don't know how BCS bowl selections are made, nobody backs in. The #1 and #2 play in the BCS games. The Rose bowl gets the champs of the B1G and P12 if they aren't playing in the BCS game. If one or both of them are, then the Rose Bowl, just like all the other bowls, is free to choose from the remainder of the top 14 BCS teams. Tue, Jan 3, 2012 : 2:52 p.m.
Tue, Jan 3, 2012 : 2:43 p.m. If a 3 loss (with 2 blowouts) MSU team made the BCS, would the system be flawed? Tue, Jan 3, 2012 : 12:50 p.m.
Michigan football coach Brady Hoke: &quot;I think this is where Michigan should be.&quot; Well, it's a good thing somebody thinks it, because outside of the state of Michigan, no one believes it. The Sugar Bowl is this year's poster child for everything that is wrong with the BCS, and that goes for Virginia Tech, as well. I don't hold that quote aganst Hoke because I realize he is just doing his job, but I would hope that at least some Michigan fans realize neither of these two teams deserve a BCS bid, but I won't hold my breath. After all, &quot;Fan&quot; does come from &quot;Fanatic&quot;. Tue, Jan 3, 2012 : 4:59 p.m. So then who was more deserving? Little brother was not, they lost three games and finished ranked out of the top 14. The only team that may have been more deserving than Michigan and Vtech is Baylor but they lost 3 games and did not play in a title game. Houston and Boise are always on the fringe because they play junk teams all year. So then you MMPPCC must be referring to Little Brother and quite frankly they dont have as good a team as Michigan right now! You lost 3 games and Michigan has lost 2. You are ranked 17th and Mich. is 13th! Michigan is ranked higher in every poll except the AP. If my logic is flawed then by default ND is a better team then little brother this year! Go Blue!!! Tue, Jan 3, 2012 : 3:54 p.m. The way Houston handled PSU, the fans of PSU probably ought to be a bit shy with criticisms of other teams. Tue, Jan 3, 2012 : 3:42 p.m. Right, they played 10 bowl bound teams, which is undeniable evidence that there are way too many bowl games. What they didn't do is win the B1G or even play in the championship game. The most generous boast about this team is they were considered by some (certainly not Penn State fans) to be the 3rd best B1G team. Lol, lets think about that for a sec....not that a 10-2 UM team needs to be defended, because any UM team at 10-2 will be BCS worthy. UM was the only team in the country to PLAY TEN bowl teams on their schedule this year (an ncaa record i might add), and they are 1 of only 3 schools to BEAT 8 BOWLBOUND TEAMS. You wanna guess the other 2? LSU AND Ok St.
Tue, Jan 3, 2012 : 2:13 p.m. Neither of these teams deserve a BCS bid? Where are you coming up with that? The BCS has tons of flaws, but to say that they don't deserve a bid is to discredit what both of these teams have done throughout the entire season. I suppose it's pretty easy to sit back and say that, but it honestly sounds like sour grapes on your part. GO BLUE! It's a good post-season match up, as were several bowl games this year. But, this game is no more than that. The biggest sham is the 2nd Alabama v LSU match up. LSU v Stanford or LSU v Oklahoma State would have made some sense and been entertaining , but not this. If there's any justice in the final BCS standings it will be Oklahoma State #1 and whoever wins the Alabama v LSU game #2. Tue, Jan 3, 2012 : 1:19 p.m.